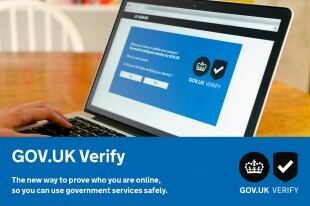 GOV.UK Verify is the new way for people to prove who they are when using digital services. It will replace face-to-face and postal methods of verifying people’s identity, so the process can be done online..
You will be able to choose who you’d like to verify you from a list of certified companies. Working with certified companies means your information and transactions with government are safer, simpler and faster than any other method. You’ll need to set up some security questions and create a username and password - keep these in a safe place for when you next login. You need to have an email address and a phone number, this can be a mobile number. How long you’ve lived at that address and previous addresses. Don’t try to guess the answers to security questions. If you answer wrongly, you won’t be able to continue. If you use your driver’s licence, only photocard versions will be accepted, not paper licences. You'll need the 16 digit licence number. The certified companies have online guidance to help you register. If you have problems, read their guidance or contact them direct. Once you’ve verified your identity, it’s fast and simple to use the same company every time you need to access a government service online. Read more about it on https://identityassurance.blog.gov.uk. Government Gateway cannot be used to access the new CAP Information Service. I was not able to register as Experian could not verify my identity...?? Sorry to hear you are having problems. The GOV.UK Verify service is a new and continuously improving service. Let us know what further feedback you have. The “hints and tips” on the blog post above may help if you want to try again or you can call the Experian helpline on 0344 481 8192. I had same problem with Experian. The Gov site said that with my answers Experian were only ones ready to verify as I had driver licence and not passport. Yet after filling in nearly every section, it then asks for passport which I do not have and that was end of all my efforts. All wasted. One big corruption!! - Experian management staff is hired through political connections not based on their experience!. It created one big loophole to produce false credit reports etc. and now they taking part in a government project - sucking public money and providing service which doesn't work!!! Unfortunately an error occurred whilst attempting to log you in." This couldnt be more complicated if you tried we are farmers not computer experts! clicking on identityassurance.blog.gov.uk wont open as "insecure".This doesnt give me much confidence in the rest of it. Thank you for spotting that, the hyperlink on our blog was incomplete. It should be - https://identityassurance.blog.gov.uk. I was not able to register as Experian could not verify my identity ?? Unable to register with Experian. Been through the whole process twice now and talked to Experian help line on both occasions but they are still unable to make it work. Latest advice is to leave it until next week and try again! Sorry to hear you are having problems, we recognise that is extremely frustrating for you. Experian have noted your problems and we'll use that to help us make improvements to the service. Let us know what further feedback you have. Do try again. There will be an alternative way to access the CAP Information Service for people who for some reason are not able to verify their identity, and we will be publishing more information about that soon here. defra cap team have been in touch since seeing my post here and are hoping to sort the registration problem by the end of the week. I am experiencing problems getting my identity verified. My passport and drivers licence went through no problem but the bank account number will not verify. I am using the post office to verify my identity and after clicking the chat button have been waiting over an hour to get a reply. Some of us work full time and don't have hours in the evening to sit waiting for something that should work straight away. I was also unable to register as the Experian identity verification process couldn't be completed. They seem to think I have credit card numbers which I do not have. I have discussed this on the phone with them and have been unable to resolve this. I look forward to receiving details of alternative ways to access the CAP information Service. Like many others I have had difficulties trying to verify my identity. The amount of information needed seems a little excessive, especially considering I can access bank accounts and leave the country with less than is needed here. What's more there must be large amounts of money going into phones lines and technicians to help resolve the problems when simplifying the process in the first place would have reduced this. Also the farmers using this service are not computer wizz kids, (not being rude) and it seems that there has been little thought as to how they would find using this service. I have had four goes at registering but cannot get past the address stage, the site must have complete re-vamp. An absolute waste of time! I've now been through the process three times (an hour and a half) and Experian still can't verify my identity. They want details of a credit card that I dont have and I cant remember the exact dat that I moved to my current address in 1984! Is this all really necessary??? I have been unable to register with Experian as they claim we have a credit card which we do not have. The first time I tried, I called Experian and the outcome of 30 minutes on the telephone was the implication that they were right and I was wrong and suggested I get one of their reports (£14.99) which would show all the cards we had. I refused to do this. They then said the only option they had was to cancel my account and said I could try again in 24 hrs. I called the CAP IS helpline and l explained my predicament and was told there wasn't anything they could do other than log the problem. I have now tried again with exactly the same results. Has this been tested prior to release to BETA? What I fail to understand is that, having got a UK passport - used worldwide to verify my identity, a UK driving licence - used by Police to verify my identity, a PI No., an SBI No., a Holding No., and a Vendor No. as well as a Government gateway sign in, all of which was perfectly acceptable in the past, and was earlier today when I signed in to HMRC to pay my VAT, none of the above are good enough anymore. I look forward to receiving an email telling me that this is resolved when I will happily try to get to the BETA version of the CAP IS to provide useful feedback. Like WJ Willcocks I have been unable to register as the Experian identity service asked me to verify the card provider of a card I do not have. Then their helpline were unable to help me. Perhaps you should be using an identification service with up to date card details?! I have endeavoured to verify my identity FOUR times with Experian, wasting hours in the process. Each time I have been unsuccessful I have contacted Experian's helpline, who then cleared my account and asked me to try again. FINALLY, today, I have established that despite living at my address for 24 years, paying taxes and all my other bills, I do not have a "Credit Footprint" to verify my existence and this is why I am not succeeding! I find this both insulting and a huge flaw in the system. Experian tells me these criteria are Government's, not theirs and hence I should complain at Gov.UK. Experian wont verify me because I dont have a mortgage, credit card, loan or mobile contract. What has my credit score got to do with the gov.uk??? I have always renewed online because i am unable to write forms due to a hand injury. So why ask for my passport if it isnt enough? they should tell people that they also need to have a credit report! I feel discriminated against! Can people not choose to register with the other provider, Verizon? Or do they have to use Experian? This is a very typical government project set up and run by people with no real experience of "how life really works". There isn't any question about identification and/or verification that would lead to Experian being the right answer. It is also clear that whoever 'designed' this system did not understand the problem to be solved at all other than the need to either reduce costs or make sure the 'old pals'get their reward! Like so many others I have tried unsuccessfully several times with Experian, several phone calls later I have been told that, a current passport, driving licence, living at my current address for over 20 yrs, with the associated utilities bills, bank accounts....the list goes on, is still not enough info to verify my identity. The advise I have been given is that as I havent been in enough debt over the past 6 years I need to get some credit history, I can do this by getting loans, credit cards etc. If a business is a partnership will all partners need to go through the verification process or is it just the partner making the claim? "If a business is a partnership will all partners need to go through the verification process or is it just the partner making the claim?" We were told at a recent NFU meeting giving the latest updates on the new CAP scheme, that ALL Partners will need to register which as was pointed out will be a load of fun when you have an extended family partnership with some Partners "getting on a bit"! Sadly, yet again a major Govt computer project has not been tested and proved before launching... Plus ca change?? It is of little comfort to farmers who want to get on and get registered to be told that there are other Verificataion bodies coming soon, but no real timescales! Thanks for your query. Only one beneficiary of the claim needs to register via GOV.UK Verify, but once on the digital service they will be prompted to supply their business details including details of other accountable people in the partnership, such as business partners. I have spent most of the afternoon trying to ascertain why Experian couldn't verify me! At first an attempt was made to "unsuspend" me without finding out why I had been suspended. All efforts to confirm my identity still failed. I then had to ring Experian again and after a multitude of changes of passwords, memorable words and mutterings, it was still unable to "verify" me! It was questioned whether my "credit" was ok, and eventually decided I need to upgrade to a photo driving licence despite my passport being in date. It seems such a long time now since I first tried to register, but I thought I needed either passport of photo driving licence, perhaps I was wrong!. I have now had my application erased and will need to get a photo licence(I have been advised) and then reapply. (when I have a bucketful of patience)! But having read others comments I am not convinced that Experian is the way forward.! Beware if you opened your personal bank account before 2007 and do not have a personal credit card as you will not be able to be verified by the Verification Organisation. The system is already not fit for purpose and needs daily fixes to allow more people to access the information. I am really looking forward to trying to verify a client who does not have a passport, a photocard drivers licence , credit card or computer. I hope the RPA and Government realise how many applicants there will be in this catergory. We recognise that not all customers will be able to use GOV.UK Verify currently. You can also call the Rural Payments Agency on 03000 200 301 to create an account. This takes about 20 minutes, lines are open Monday to Friday, 8:30am to 5pm. I got through the whole process successfully via Experian, and managed to log in to the CAP service, last night, and use it. When I came to log in again today, the Experian verification service sent an access code to my mobile phone number. I had provided the mobile number to them last night in answer to one of their questions. Only problem is - I have no mobile phone signal on the farm. I guess I am not the only one in this position? I rang Experian who said that this was a problem they had seen before. The operator told me one story of someone who had driven 20 minutes to get phone signal, only to find when he returned to his computer that the verification code is only valid for 5 minutes! The operator asked if I could perhaps do my CAP service session at a local internet cafe! When I said this was not possible, they said the only other option was to delete my verification account, and for me to try setting up the account again in 24 hours, but next time don't give a mobile number. Like other users, I also question the need for this. We use government gateway for many other services (VAT, Cattle Tracing Service, surveys, real time PAYE, etc etc). Why does the CAP service need some other way of verification? Update: 24 hours later, I tried to do this again as requested by Experian. When I got to the page that asks for a mobile phone, I tried to do as previously asked by the Experian operator: to not give a mobile number. The page will not let you proceed without a mobile number. I rang Experian, and the operator told me this time that I could not use their service without a mobile phone that has signal. Wouldn't be helpful for users to be told this before starting out? We recognise that not everyone will be able to use GOV.UK Verify successfully. Please call the RPA on 03000 200 301 and they will help you register. The helpline is open Monday to Friday, 8.30am to 5pm, and with some extended hours over weekends. Please let us know if you have any further problems. At last! I rang the RPA, and they set up an account for me in a few minutes - painless! It occurs to me that the mobile phone issue might be a *big* problem for agents. They might successfully set up lots of client CAP service accounts from their comms replete town office, only to find when visiting their clients, that they are unable to access these accounts. I registered with Experian Identity service and successfully registered for the RPA online service and even managed to view my land map. . Unfortunately an error occurred whilst attempting to log you in. and was told to try again on 2nd Feb. Tried again today 5th - same problem. phoned helpline was asked to wait as their system was slow but after a further 5 mins the line was cut off. I waited but heard nothing then being an optimist tried again.... It worked ! All my financial details were rejected, on an account that must be 40 years old, something to do with 2007 privacy act. Had to resort to a very helpful phone operator. Rejected twice by Experian just on my address details even though i have lived here for 27 years.Tried with Post Office but credit card number was rejected have had this account for at least 20 years.What a waste of time!! Looks like i will have to do it on the phone. Sorry to hear you've been having problems with using GOV.UK Verify. We recognise that not everyone will be able to use it so please do call 03000 200 301 to register. I have got the EXACT SAME PROBLEM ! I used my Passort with only 2 years left on it.... within 8 minutes ACCEPTED !!! I used my renewed Drivers Licence only a month old... within 10 ACCEPTED !!! But then I tried 3 Bank Accounts, NatWest Business, Halifax EasyCash, and Halifax Current, all continuously REJECTED !!!! This bank requirement is the final stage, and I am due to declare my income with HMRC !!! What is this a cruel joke? Registration problems are extremely frustrating. Too much stress before you even begin to start to use the service. experian wants my drivers licence OR passport details, i don't have a passport so no matter but no, experian wants passport details otherwise i cannot be verified??? why on earth can't the government just leave things alone and carry on with the old system!!! Same problem "driving licence" OR passport"
well which I do not have.Waste of time. Was told by HMRC website that to claim a tax refund payment I had to use GOV.UK Verify. HMRC had not answered my email sent December 2014 concerning the refund of an overpayment. I could not use GOV.UK Verify as I dont have a mobile phone number. Why is GOV.UK Verify required when I am already securely logged into HMRC with all the required passwords? I was not able to register as Experian could not verify my identity. Tried the Post Office and registered. My question is - has this process with Experian cost me anything? At the end of the process I was unsuccessful like many it seems but that is after giving my details including my bank details. I want to cancel and pull my details off their system Experian. Thank you for your comment. There is no charge for using this service, it has not cost you anything. You can ask Experian to close and delete your account by contacting their support service on 0344 481 8192. Tried both on Digidentity and post office to verify. Both accepted my passport and driving licence but both rejected either of my 2 credit cards. Another government fail. Guess will have to sit on phone for an hour to get tax refund. I can't go through my identity because they need my driving license but I don't drive? I tried entering my passport details but still won't let me through unless I put in driving license aswell!? This is very frustrating as I'm deaf so cannot hear on phone or have text talk phone. I'm trying to claim my tax back due to overpayment since I started working at my job, sick of hundred and so taking from me each month when I don't earn enough! With Experian it says you can use either passport or photo driving licence (which I don't have), but once you've spent ages filling in details it transpires you need passport AND photo driving licence. Hello, sorry to hear you’re having trouble with Verify; please do call to register instead by calling the Rural Payments Agency on 03000 200 301. There is no deadline by which to register but the claim deadline is 15 June 2015 for the Basic Payment Scheme and there's more to do this year due to the new CAP policy so we're advising farmers to register and complete the required actions as early as possible. I was able to have my identity verified by Experian and managed to access my account. However, once I logged out I was not able to log back in even though my CRN was verified by someone on the rural payments agency. I then tried to re-set my password but my email was also not recognised. In a further call to the RPA I was advised that I need to call Experian directly to break the original verification process in order that I can start again in my effort to create an account. I was not given a number to contact. I take it the number quoted above is the one I need to call? Hi, I'm trying to verify my identity using Post Office, however it keeps rejecting my credit card number. Can someone confirm if this refers to the long number on front of credit card? Have tried debit and credit card details, both being rejected despite being correct. Its just not good enough really. Bank account details not recognized. A system like this should be user friendly and include advise and reasons for a rejection. The UK Gov has a terrible reputation for being unnecessarily difficult or lacking in professional standards. Every time I try to log in I simply get a message saying that an error has occured. This is somewhat frustrating having spent 15 minutes completing the registration process. Is there a contact number through to IT support? my passport and post office account were both rejected but my driving licence accepted....eventually !!! this is ridiculous and terribly frustrating !!!! It wouldn't let me verify my identity without providing my driver's license details (of which i dot not have, as i do not have a driver's license)! It would not let me proceed with just my passport details? Yup, same as above - was told that I could register with Experian using just a passport, but it transpired that I needed both a passport and driver's license. HMRC are so incredibly frustrating. Thanks for your question but as this blog is for the Rural Payments service we are unable to answer any questions regarding HMRC issues. Please try this link <https://www.gov.uk/government/organisations/hm-revenue-customs&gt; for further information instead. it is scary how much of our sensitive personal information is being handed over ( and incorrectly stored at times, it seems) to a company that cannot do this simple verification task. This does not inspire confidence. The frustration of this system is beyond measure. I never got an email from Government Gateway that they were planning to end this scheme!!! It will not give me a reason why!!! Experian kept me an hour and half, had to match bank details that didnt actually exist, then they failed to send a text to my phone to verify it, then the whole thing failed. Waste of time. Called them but all they could say was to cancel my account and try again. I keep getting "an error has occurred" right after I input the One time code for Experian identity service, I then get "Session has timed out" I've tried this about six times now what's going on? "Beware if you opened your personal bank account before 2007" -- Indeed. Thanks to Howard Smith and Roger Lord for their comments. No thanks to anybody in officialdom, or at the Post Office, who evidently couldn't be bothered to prevent me having the same problem that Howard Smith and Roger Lord had. All it would need is one sentence on the relevant page like "If your bank account is being rejected, and you opened it before 2007, please try a newer bank account if you have one." Post office has accepted my passport and bank account but keeps rejecting my driving licence, why?!??? Tried to register with Experian as N. Driving licence not acceptable to the other companies. Despite giving every answer correctly just got a message saying that it as not possible to verify who I was based on the information supplied. No idea how to proceed as no advice offered. Far too complicated system. Surely if I have a passport, registered address, bank account, credit card and mobile phone it MUST be possible to verify who I am! Post office keep rejecting my bank account number. This is very frustrating and no one from the post office has even bothered to come back to me. My fault for thinking this was going to be a simple process! Received HMRC email inviting me to apply for marriage allowance following a registered interest. Tried to verify online with Post Office which stated marriage allowance not available yet! Any suggestions? Thanks for your question, however as this blog is for Rural Payments Service we are unable to answer any questions regarding HMRC issues. Please try this link. ****** Please if you read these comments "DO NOT WASTE YOUR TIME WITH EXPERIAN" you would expect a company as established as this would have dedicated some capable resources to engineer this service but looks like they employed some 5 year olds to put it together. The Post Office portal is much better although still not 100% but at least it looks like they have thought through and tried to make as going through as easy as possible. Can't verify my passport even though it was renewed in Feburary. Government selling out services to 3rd party companies and FAILING MASSIVELY.